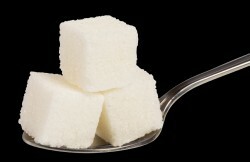 Sugar…what is all the fuss about? carbohydrates are generally smaller, simpler structures and of lower molecular weight than starch (polysaccharides). Carbohydrates in sugar form perform numerous roles within the body including storing energy, providing blood glucose and playing key roles in the immune system, fertility, and helping support growth and development. Despite often receiving a bad press sugar is a natural part of the horse’s diet and horses are highly efficient at digesting it, in fact glucose – blood sugar – is vital as it is the only source of energy the brain can use. So let’s “break down” sugar myths and explain a bit about how sugar really works and why if it is fed with due care and attention it is in fact essential and highly beneficial to our equines. Sugar is used by the cells of your horse’s body as a primary source of energy. The food source containing the substance is broken down by the digestive system, providing a simple nutrient which can be easily received and utilised by our equine’s bodies. Our horse’s cells need glucose for both energy and cellular respiration. Naturally glucose can be found in plants as it is actually one of the substances produced during photosynthesis! Alongside providing energy and assisting in development and repair, digested sugar stimulates the body to produce insulin which is recognised by the brain and signals to the body to stop eating when full. If insufficient levels of glucose are present within the body, in addition to low energy levels, the mental abilities of the individual can actually be impaired. You yourself may have felt like that at some point when you were particularly hungry, energy drained or desperate for a sugar fix! Excessive sugars however can overwhelm the body and this happens when the equine’s body simply cannot regulate the quantity received. If excessive sugar is provided in your horse’s diet long term it can lead to weight gain as the equine’s body, just like in humans, converts excess sugar energy (or calories) into fat and stores it within the body. Sugar is an essential part of all our horse’s diets. Grass in fact holds the largest source of sugar in any equine’s diet as it typically contains 20% sugar in the dry matter (DM) content. The average horse weighing around 500kg will typically consume 50kg of fresh grass (approximately 10kg DM) in a single day, equating to around 2000g of sugar. 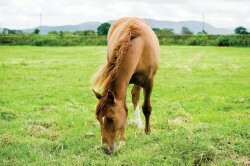 In simple terms the horse can often consume what equates to 2 whole bags of sugar per day simply from the grass! As you can see sugar can have both positive and negative effects on the body but providing it is fed at optimum amounts, and therefore safely, it provides an essential part of our horse’s bodily functions and a natural part of their diet. The rate of consumption of sugar is vital in order to positively effect digestion, and a responsible horse owner will ensure safe, sensible quantities are consumed. A healthy diet for an equine involves a predominately forage and fibre based diet but with additional vitamins and minerals. However modern pasture is often overgrazed and therefore deficient of vital nutrients so alongside ensuring your horse has sufficient roughage in his diet to maintain a mobile digestive transit, palatable licks such as Horslyx can provide a useful addition to the diet. Some horses in hard work do require a cereal feed for additional energy but many do well on forage and Horslyx alone! To find out more about feeding Horslyx click here.